Yesterday after market close, Arctic Star Exploration Corp. announced to acquire 100% of 243 hectares centered around the 2 diamondiferous Black Wolf and White Wolf Kimberlites in northeastern Finland, about 17 km from the town of Kuusamo and 24 km west of the Russian border. Arctic also announced that float samples were collected at the White Wolf Kimberlite during a due diligence site visit, which were sent to the Saskatchewan Research Council’s laboratory for caustic fusion analysis. The results (see below table) confirm the presence of 58 microdiamonds (ranging in size from 0.106 to 0.425 mm) within the 18.9 kg samples. In 2006, an 8.8 t kimberlite sample was extracted from the Wolf Kimberlites from 2 shallow backhoe trenches. These samples were run through a gravity separation circuit at the Finnish government facility in Outokumpu and 1.25 carats of >1mm stones were recovered (largest stone was 0.09 carats). Kimberlites and related rocks occur in clusters that commonly range from 10-30 bodies, but clusters can exceed 100 kimberlites. To date, 2 kimberlites are known on the Timantti Property: Black Wolf and White Wolf, which are located 50 m from each other. The next steps are to quickly gain a better understanding of the Wolf kimberlites. Arctic‘s site visit confirmed the Wolf kimberlites contain both pyroclastic (formed near surface) and hypabyssal (formed at depth) kimberlite types. Arctic plans to complete detailed magnetic, gravity and electro-magnetic geophysical ground surveys, which will be used to target further drilling. The drilling will help define the shape and tonnage of each kimberlite and collect more material for caustic fusion analysis for microdiamonds. The microdiamond distribution will determine the parameters of a bulk sample (to determine grade and diamond value). Kevin Kivi (P.Geo), author of a new NI43-101 Technical Report (effective date: June 20, 2017) visited the Wolf kimberlites and collected several rock samples which tested positive for diamonds. According to this report, Arctic Star‘s exploration program should commence with re-logging stored drill core from the Black Wolf and White Wolf kimberlites, and sampling these for microdiamonds in order to establish a larger microdiamond sample, which is used to predict diamond grade. Core samples are also to be submitted for petrology and KIM geochemistry for each kimberlite. About 100 boxes of drill core is stored at the National Drill Core Archive (NDCA) in Loppi, Finland, where 14 core holes (529.85 m) are available. Arctic‘s field exploration should also consist of till sampling using an excavator, detailed ground geophysical magnetic, electromagnetic and gravity gradiometer surveys, mechanical trenching, and core drilling. New kimberlite discoveries should be tested for diamonds while trenching, so that only significantly diamondiferous kimberlites are core drilled. Finland is regarded as one of the world‘s best countries for exploration and mining as it has abundant mineral potential, clear regulatory guidelines, an effective tax regime and a robust labour market. The Fraser Institute ranked Finland first in the world in 2015, as the most attractive jurisdiction for mining investment. The Timantti Project is located about 24 km west of the Russian border and 17 km from the Finnish town Kuusamo (an 8 h drive from Helsinki; the Kuusamo airport has direct flights daily to and from Helsinki). Kuusamo is a major centre for winter sports and receives a million tourists every year. The Ruka ski center, located 11 km northwest of the Foriet Property, has 16,000 beds, 4 hotels and 28 restaurants. Ruka is host to major competitions including ski jumping, cross country skiing and Nordic combined. Tourism activities include ice fishing, snowmobiling, and dog and reindeer sled expeditions in winter. In the summer, activities include fishing, kayaking and hiking. The main economic activities of Kuusamo are forestry, reindeer husbandry, small industries and tourism. Unemployment is high at 16.2% (2003). Kuusamo has subarctic climate with severe winters, no dry season, cool short summers and strong seasonality. Mean temperature is 0.6°. The climate and operating season will allow mineral exploration including geophysics, diamond drilling and mini-bulk sampling to occur throughout the year, with optimal conditions from May through October. Arctic Star intends to discover an economic diamond deposit in the Finnish part of the Karelian Craton. The geological potential of the Karelian Craton has been demonstrated by the discovery of world-class diamond deposits in the Russian part of this craton. Cratons are very old areas of the earth’s crust that have remained stable for around 3 billion years and are the world‘s dominant source of diamonds. The Karelian Craton of Archean age hosts the Lomonosova and Grib Mines in Russia, both very large operations, which were discovered relatively recently in the 1980s, respectively mid-1990s. Some 450 km to the west, Arctic Star is searching for something similar on the same craton in Finland. The Karelian Craton is host to several kimberlite fields and clusters in Finland, most of which are diamondiferous. The 2 main areas are Kuhmo-Lentiira in eastern Finland and Kuopio-Kaavi approximately 200 km to the south. Eastern Finland is an underexplored region although it is known to host diamondiferous kimberlites in very similar rocks to those in Russia. The potential of finding a large diamond mine in a stable and mining friendly jurisdiction is the basis of Arctic Star‘s investment case. Russia‘s leading oil and gas company, Lukoil, reported revenue from sales of around 4.5 million carats of rough diamonds from the Grib Mine in Russia in the amount of nearly $340 million USD for the year 2016 (+82% increase over 2015). This was some of the last revenue Lukoil earned from the mine, which started in September 2014, as last December Lukoil sold the mine to Otkritie Holding Group (Russia‘s largest privately-owned financial company) for $1.45 billion. Grib is the world‘s 8th largest diamond mine, the 4th largest in Russia and the only major diamond mine in Russia that is not operated by Alrosa, the world’s largest diamond producer by volume (38.3 million carats or 30% of the world total). It is expected that Grib will become the largest diamond mine in Russia in terms of size. The average grade is reported at 1 carat per t of ore. Of the estimated reserves of 98.5 million carats, 58 million of them are planned to be mined over 16 years with an open-pit with a depth of nearly half a kilometer, with the remainder to be retrieved through underground mining. Alrosa‘s near-by Lomonosova Mine started commercial production in 2005 with an annual capacity of 1 million t of ore. 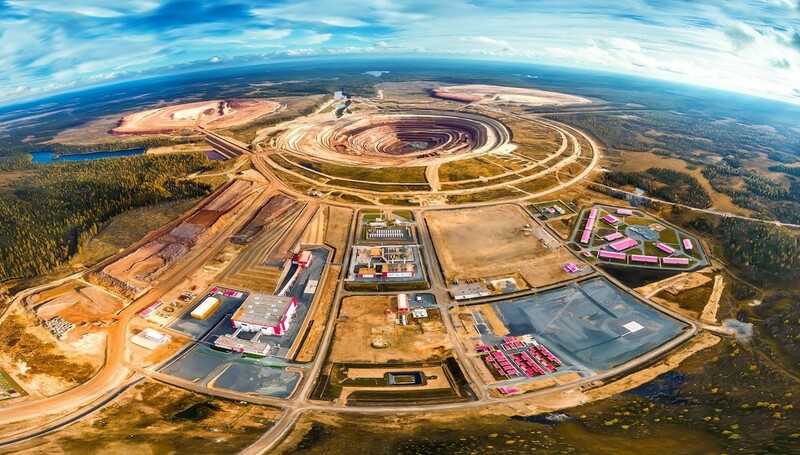 In 2014, a second module of the plant was commissioned to increase annual capacity to 4 million t. The primary deposit consists of 6 kimberlite pipes with total resources exceeding 115 million carats. The 2 pipes Arkhangelskaya and Karpinskogo-1 are the main deposits of current focus. The Arkhangelskaya Pipe was discovered in 1980; open-pit mining started in 2005; current reserves sufficient to maintain diamond mining until 2033; output in 2014 was 1.2 million carats; ore resources inclusive of reserves are 87 million t; average diamond grade of 1.1 carats/t. The Karpinskogo-1 Pipe is located 750 m northeast of the Arkhangelskaya pipe; mining started in 2014; current reserves sufficient to maintain diamond mining until 2033; output in 2014 was 1.1 million carats; ore resources inclusive of reserves are 22.5 million t; average diamond grade of 1.32 carats/t. What makes Lomonosov special is that it yields fancy colors (purplish pink, violet, green, yellow and brown) in addition to a high percentage of gem-quality colorless (D to Z) diamonds. It is reported that 1 in every 350 carats of Lomonosov’s annual production is fancy colors (compare that against the often cited statistic that only 1 diamond in 10,000 mined around the world can be called fancy colored). Mr. Power is a seasoned venture capitalist and financier with over 20 years of experience as a stock market professional and as director of public companies. He has been President and CEO of Arctic Star since its inception in 2002. Additionally, Mr. Power serves as a director of other mineral exploration companies. Arctic Star benefits from Mr. Power‘s wealth of experience as a shrewd dealmaker, an adept financier and as a tireless, results-driven leader of dynamic public companies. The company enjoys Mr. Power‘s large network of contacts within the industry, his enthusiasm and his efforts as a member of the audit and remuneration panels. Mr. Doyle has 25 years experience in mineral exploration. He worked for Rio Tinto PLC for over 23 years, most recently he was Exploration Manager/Vice President of Kennecott Canada Exploration Inc. (owned by Rio Tinto), in charge of diamond exploration in North America. He was a key member of the Kennecott Exploration Australia team that discovered the multi-million ounce Minifie gold deposits at Lihir in 1987-1988 and led the team which discovered the Diavik diamond deposits in 1994-1995. Few geologists have seen 2 projects from discovery through to decision to mine. Mr. Doyle is recognized by his peers in the exploration industry as an authority on diamond exploration and kimberlite geology, and has authored/co-authored numerous papers on these subjects. He recently was awarded the 2007 Hugo Dummitt Award for excellence in Diamond exploration. Since leaving Rio Tinto Mr. Doyle remains active in the diamond sector through consultancy and non-executive directorships. Mr. Doyle brings to the company a disciplined scientific approach to mineral exploration and managerial skills that have a proven track record. He holds a BSc in Applied Geology from the Queensland University of Technology. Today, Mr. Spencer was appointed to Arctic Star‘s Board of Directors. He led the team that discovered the multi billion dollar Grib Diamond Mine in Karelia, Russia, and was the original discoverer of the Wolf kimberlites in Finland. Mr. Spencer joined De Beers upon graduation from high school in 1966 and has been involved with exploration and deposit evaluation for gemstones and other commodities throughout his career. His tertiary education was at the University of Natal and Rhodes University in South Africa, and is a member of the Geological Society of South Africa and a Fellow of the Aus.I.M.M. As technical director of Peregrine Diamonds, he discovered the first kimberlites on the Pilbara craton in Western Australia in 1989, and as Leader of the Owners Team for Archangel Diamond Corp. he was largely responsible for the discovery of the world-class Grib Kimberlite in far northern Russia (February, 1996). In 1998, Spencer created and raised the seed finance for Ilmari Exploration Oy to explore for gold, base metals and diamonds on the Karelian Craton in Finland. Ilmari went public in 2000, and discovered the Lentiira kimberlite cluster in central Finland in 2003. In 2006, as CEO of London-based diamond explorer European Diamonds, Spencer led the Owners Team which brought the Liqhobong kimberlite (Lesotho) into commercial production on time and under budget. In mid-2007, he left European, a company which had evolved into a successful mid-tier diamond producer and marketer after having raised £23 million over a 6 year period. Since that time, Spencer has continued in gemstone exploration and deposit evaluation in Africa, Finland and western Russia. Today, Mr. Eldridge was appointed to Arctic Star‘s Board of Directors. He is experienced in the financial industry focused on the resource sector. He is a co-founder, President and CEO of Euroscandic International Group Inc., a private company offering accounting and investment banking services to natural resource companies. During his time in the industry, Eldridge has been responsible for raising in excess of $500 million in combined equity and debt financing for mining projects varying from exploration to construction financing around the globe. Eldridge has a BBA from Capilano University, and an MBA from Central European University. Mr. Ferreira is an exploration geologist with over 30 years experience in gold, base-metal and diamond exploration in Canada. Mr. Ferreira holds a master of science degree from the University of Manitoba and a bachelor of science degree from the University of Minnesota, Duluth. Mr. Ferreira‘s employment experience includes work for Noranda Exploration Canada, Esso Minerals Canada, Getty Mines, Falconbridge Ltd., Granges Exploration, Canmine Resources Corp. and San Gold Corp. Mr. Ferreira is past president of the Manitoba Prospectors and Developers Association. Mr. Ferreira is currently a member of the Association of Professional Engineers and Geoscientists of the Province of Manitoba, and is a director of another publicy listed company. Extensive diamond exploration experience; Since 1997 independent geophysicist with his own consulting firm, Intrepid Geophysics Ltd.; Previously a geophysicist with the Department of Geological Survey of Botswana. Successful seasoned venture capitalist who benefits from >19 years experience running resource based public companies. Director of Arctic Star since its inception in 2002; For almost 2 decades he served as President of Brahma Communications Corp., an investment consulting firm. Seasoned communications professional with experience in raising capital and marketing resource exploration companies; Also a Director of Zimtu Capital Corp.
>20 years of accounting and management experience; Member of Certified General Accountants in Canada, fellow member of Association of Chartered Certified Accountants in London, England and holds Certificate in Accounting and Finance from Ryerson University Toronto; Has worked in various accounting positions (including public companies) within the manufacturing, IT and telecommunication sectors. Prepared For: ARCTIC STAR EXPLORATION CORP.
BY: KEVIN R. KIVI, P.GEO.